Funk & Little Inc. has recently taken on a project that involves removing old, leaking, 80's contractor-made skylights and replacing them with Velux solar powered openers with solar powered shades, as well as a 3 unit combination flashing kit. This project took us a bit longer than I had planned but the end result was fantastic. These units work just as advertised out of the box. The instructions, although difficult to follow in a linear fashion, did walk us through the necessary steps with no real hiccups. We did call for tech help at one point, a clarification on the waterproof membrane installation. The phone was answered almost immediately and the woman who answered clearly knew the product line and was able to answer us within seconds. She obviously didn't need to look anything up on the computer. Very pleasant surprise. 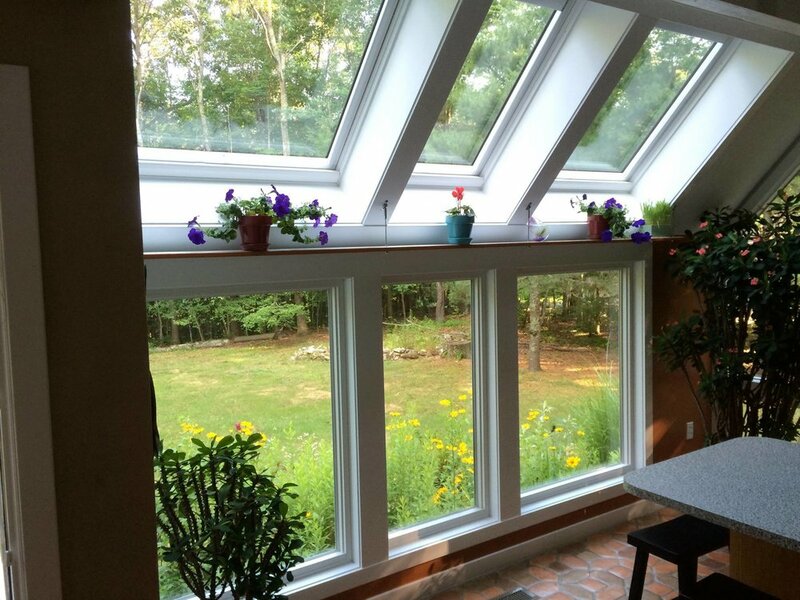 We will be adding three new Marvin windows that match the widths of the skylights and will be as tall as possible, giving this space a sunroom effect. I had a chance recently to get some pictures of the interior now that it is decorated and lived in. The shelf support is a modified use of an Easyrail cable system that we have used in previous exterior deck railing applications.